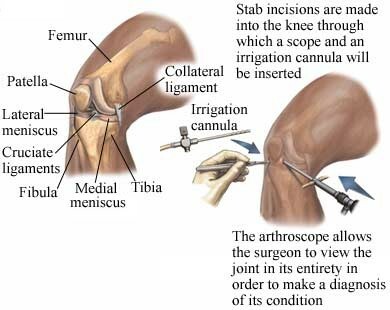 Arthroscopy is a surgery done to examine a joint visually. Most of the time, it is done on large joints like the knee or shoulder. A special tool called an arthroscope is used. It is an instrument that looks like a long tube with a miniature camera on the end. Repairs or corrections to the joint may be done by using the arthroscope and other tools. Tiny incisions will be made in the skin along the joint. Special tools will be inserted through the incisions. The tools include the arthroscope. The picture from the arthroscope will show up on a screen so that the inside of your joint can be viewed. The images may be used to move around other tools that can cut and repair tissue in your joint. Some meniscal tears in the knee will be repaired by cutting and removing some of the cartilage. Torn anterior and posterior cruciate ligaments may also be repaired by arthroscopy. When the examination or surgery is done, the tools will be removed. The skin may be closed with stitches or clips. The incisions will be covered with a dressing. The fluid or tissue that was removed may be sent to a lab for examination. Usually less than 1 hour, but this may be longer if repairs are being done. It may take 4-6 weeks for the joint to recover in a repair was done. A specific activity and rehabilitation program may be suggested. This will help speed your recovery and protect future joint function. Arthroscopy. Ortho Info—American Academy of Orthopaedic Surgeons website. Available at: https://orthoinfo.org/en/treatment/arthroscopy. Updated May 2010. Accessed December 19, 2017. Katz JN, Brownlee SA, Jones MH. The role of arthroscopy in the management of knee osteoarthritis. Best Pract Res Clin Rheum. 2014;28:143-156. Pitta M, Davis W 3rd, Argintar EH. Arthroscopic management of osteoarthritis. J Am Acad Orthop Surg. 2016;24(2):74-82. Thorlund JB, Juhl CB, Roos EM, Lohmander LS. Arthroscopic knee surgery for degenerative knee: systematic review and meta-analysis of benefits and harms. BMJ 2015;350:h2747. What is arthroscopic surgery? Arthroscopy Association of North America website. Available at: http://www.aana.org/home/for-patients/what-is-arthroscopy. Accessed December 19, 2017.